* Try the alternative of silk wedding flowers. You can find online various websites of florist stores selling you for better price these types of blooms. The great thing about these flowers is that they can be offered in all sorts of designs and colors, many of them not even existing in the real version. More than this, they are designed in such a realistic note that one can not tell that they are not authentic. It is however very important to determine the color scheme of your wedding, and in case you have decided on colors such as orange and chocolate brown, then these silk made wedding flowers can be indeed a great choice. Not to mention that for the classic black and white wedding theme, the choice of combining black and white bloom can be possible merely with the silk wedding flowers. Real flowers do not come in black color, although there might be some hybrids to contain darker shades of burgundy or brown that can be mistaken for black colored bloom. But the prices that these blooms come with are quite high, so it is definitely not an alternative for black and white wedding bouquet of the budget conscientious bride. 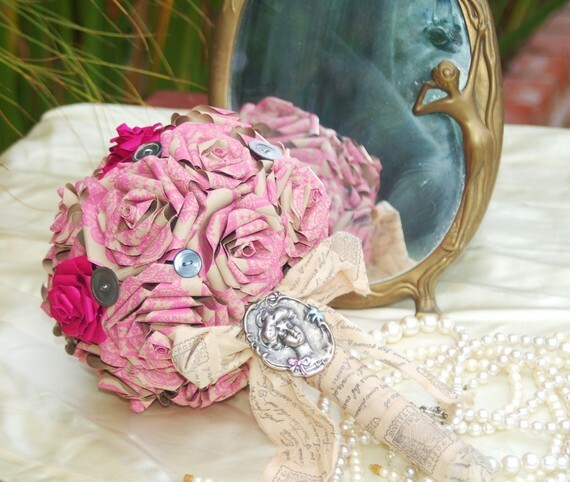 * How about paper made flowers as other alternative wedding flowers? Planning a casual wedding within an intimate environment will allow you organize the wedding celebration with flowers made of paper. Again online research will help you locate artists who are ready to take your order or if you think that you can do this on your own, then search for tutorials to introduce you to the wonderful art of creating objects from paper – origami. * The offbeat bride can opt for the ‘button trend’ and choose bouquets made of vintage buttons in combination with some decorative leaves made of leather. This is also a great alternative wedding flower bouquet used within a casual wedding celebration. * Combining silk flowers with peacock feathers and strings of beads and artificial pearls is another idea of your alternative wedding flowers. So, you should decide which the style of your wedding is before considering implementing one of the above ideas within the unfolding of your wedding celebration.